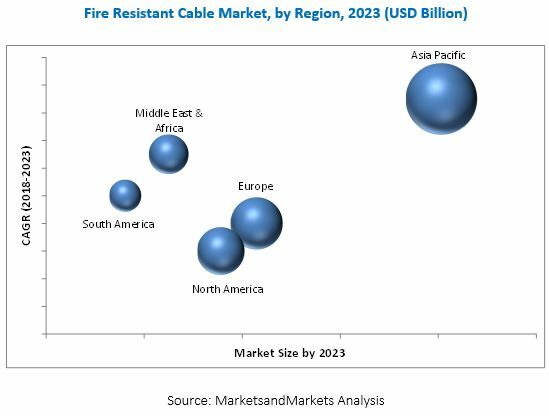 [142 Pages Report] Fire Resistant Cable Market was valued at USD 1.70 Billion in 2017 and is projected to reach 2.06 Billion by 2023 at a CAGR of 3.2% from 2018 to 2023. For company profiles in the report, 2017 has been considered as the base year. In cases wherein information is unavailable for the base year, the years prior to it have been considered. The research methodology used to estimate and forecast the global fire resistant cable market began with capturing data on key vendor revenues through secondary sources, such as D&B Hoovers, Bloomberg, Chemical Weekly, Factiva, and various other government and private websites. Vendor offerings were also taken into consideration to determine the market segmentation. After arriving at the overall market size, the total market was split into several segments and subsegments, which were later verified through primary research by conducting extensive interviews with key personnel, such as CEOs, VPs, directors, and executives. Data triangulation and market breakdown procedures were employed to complete the overall market engineering process and arrive at the exact statistics for all segments and subsegments of the market. The breakdown of profiles of primaries is depicted in the figure below. The fire resistant cable market has a diversified ecosystem of upstream players, including raw material suppliers, along with downstream stakeholders, vendors, and government organizations. Companies operating in the fire resistant cable market include Prysmian Group (Italy), Nexans S. A. (France), General Cable Corporation (US), NKT Group (Denmark), Leoni AG (Germany), LS Cable & System Ltd. (South Korea), EL Sewedy Electric Company (Egypt), Universal Cable (M) Berhad (Malaysia), and Tratos Limited (UK), among others. The scope of the report: This research report categorizes the fire resistant cable market based on end-use industry, insulation material, and region, and forecasts revenues as well as analyzes trends in each of the submarkets. Product matrix, which provides a detailed comparison of the product portfolio of each company. A further breakdown of the Rest of Asia Pacific, Rest of the Middle East & Africa, Rest of Europe, and Rest of South America fire resistant cable markets. Detailed analysis and profiles of additional market players (up to five companies). The fire resistant cable market is projected to grow from USD 1.76 Billion in 2018 to USD 2.06 Billion by 2023, at a CAGR of 3.2% from 2018 to 2023. Fire resistant cables provide circuit integrity under extreme fire conditions and are used to ensure continuous operations in case of a fire. They consist of conductors (aluminum, copper, and alloys), conductor shields, insulation, insulation shields, metallic shields, and jackets. The market for fire resistant cables is characterized by a moderate but stable growth rate. Increasing awareness regarding fire safety, the rapid pace of industrialization and urbanization, and the implementation of fire safety regulations by governments across the globe are some of the factors driving the fire resistant cable market. Other driving factors include grid maintenance, replacement of aging infrastructure, conversion of overhead lines to underground lines, and the development of rail network across the globe. However, volatile prices of raw materials and availability of low quality and inexpensive products may restrain the market growth. By insulation material, the fire resistant cable market is segmented into XLPE, LSZH, EPR, PVC, and others. The XLPE segment is expected to grow at the highest CAGR during the forecast period, due to the growing demand for XLPE insulation in fire safety for various end-use industries such as building & construction, automotive & transportation, among others. Fire resistant cable maintains circuit integrity. By end-use industry, the fire resistant cable market is segmented into, building & construction, automotive & transportation, manufacturing, energy, and others. The building & construction segment is estimated to account for the major share of the overall market in 2018. The ongoing urbanization and need for fire safety are factors driving the building & construction industry. The availability of cheap duplicates of original branded products is a big challenge for the fire resistant cable market. These products are generally available at a more competitive rate as compared to original products though are comparatively inferior in quality. The fire resistant cable market includes both organized and unorganized sectors, where the organized sector provides high-quality products while the unorganized sector offers cheaper or lower quality products to maintain their presence in the market. The leading players are facing challenges from the unorganized sector that offers inexpensive products, particularly in the emerging economies of China and India. Key players operating in the fire resistant cable market include Prysmian Group (Italy), Nexans S. A. (France), General Cable Corporation (US), NKT Group (Denmark), Leoni AG (Germany), LS Cable & System Ltd. (South Korea), EL Sewedy Electric Company (Egypt), Universal Cable (M) Berhad (Malaysia), and Tratos Limited (UK), among others. These companies focus on investing in capacity expansions to achieve growth in the fire resistant cable market. 10.6 LS Cable & System Ltd.
10.11 Dubai Cable Company (Private) Ltd.
10.15.3 Bahra Advanced Cable Manufacture Co. Ltd.